What do you do with “in-between clothes”? You know, the clothes that you’ve already worn once but they could be worn again. They’re not quite dirty enough to put in the laundry basket but not quite clean enough to go back in the closet. Do you have a chair? 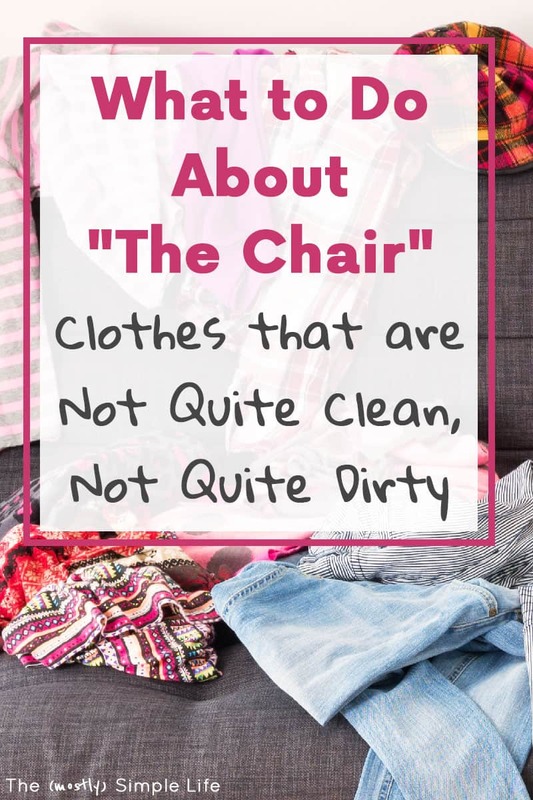 Most people seem to have a chair in their bedroom that no one can ever sit on because it’s covered by a mountain of in-between clothes. Or maybe it’s just a pile on the floor, which eventually means that you’ll consider it all dirty anyway because it’s been sitting on the floor for who knows how long. Don’t worry, you’re not alone! This is a crazy-common problem. I’ll share how we organize worn clothes and give you some tips you can use. The chair is not serving its purpose. Chairs are meant for sitting on. 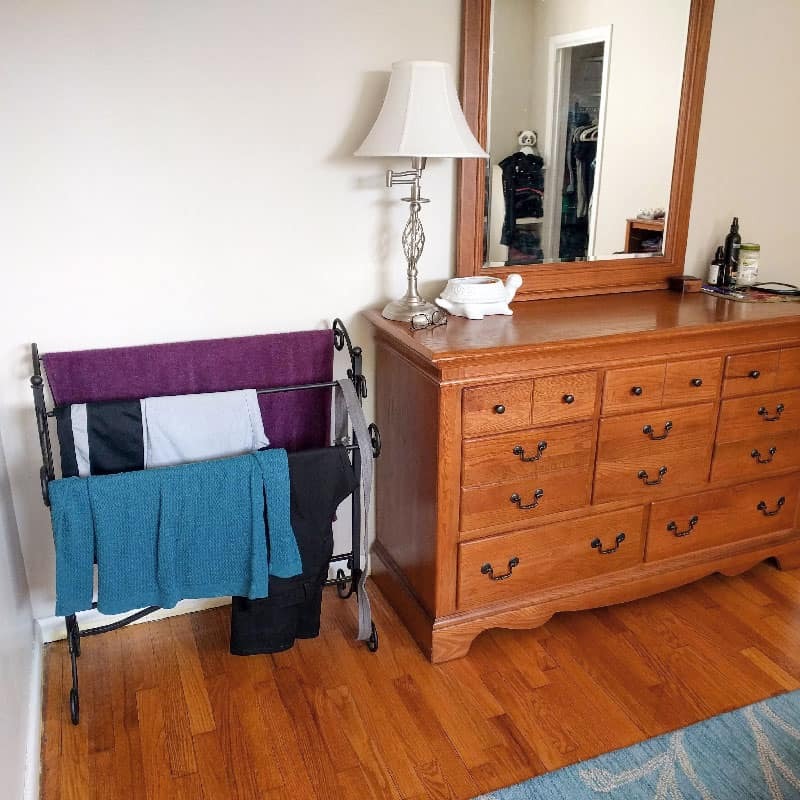 By piling clothes on it, it just looks bad because the chair is not being used how it is meant to be used. Clothes will wrinkle. 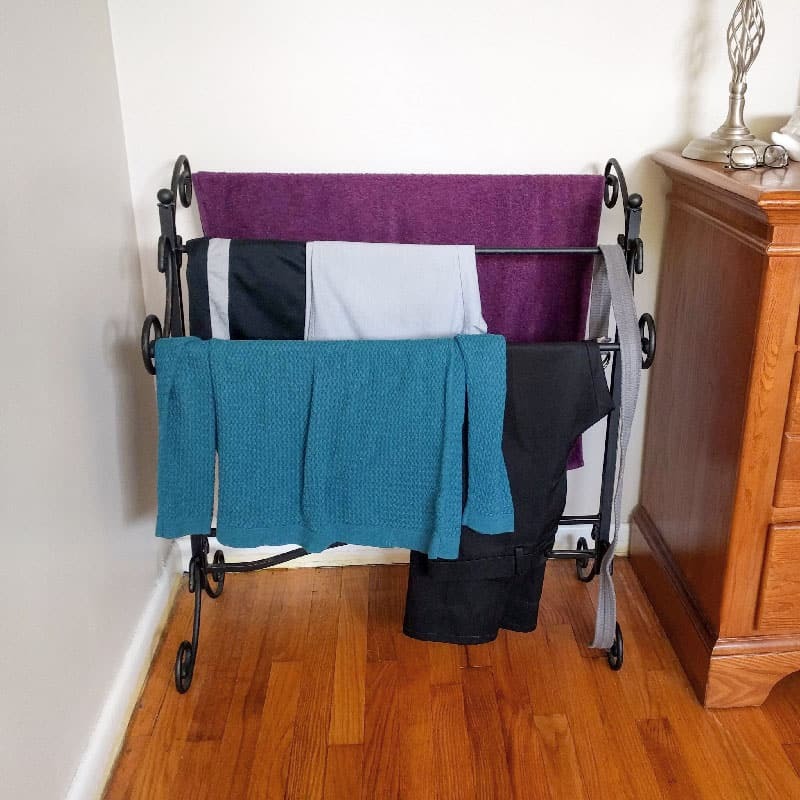 With the blanket rack, we can neatly drape clothes over the rack to be worn again. With a chair, it’s too easy to throw shirts on the chair all willy-nilly. Then the shirts get wrinkled, making you less likely to wear them again. If something could be worn again before it gets washed, it goes on the rack. We try to be fairly neat about it so that the clothing doesn’t get wrinkled. A quick fold in half and then draping it over one of the bars is all it takes. Ideally, the clothes on the rack get worn again and then end up in the laundry basket to get washed. This is the important part: On laundry day, once or twice a week, I clear off the rack completely. We keep a laundry basket in our bedroom and before I take that basket down to the washing machine, I take care of the clothes on the blanket rack. All of the clothes draped on the rack either get put into my laundry basket to be washed or get hung back up in the closet. Most clothes end up getting washed unless I know that they were only worn for a few hours. Those ones get put back away. Having a regular time to clear off the blanket rack is the key to not letting the pile of in-between clothes turn into a mountain. There has to be a point when you decide if something is clean enough to go back in the closet or dirty enough to get washed. 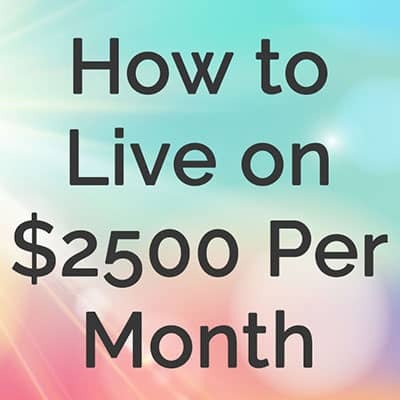 How can you apply this little system? Set a regular clear-off time. Clothes do not get to live on the blanket rack indefinitely. For me, I clear off the rack every laundry day, which is at least once a week. Make clearing off the rack a regular event so that the amount of in-between clothes doesn’t get out of control. 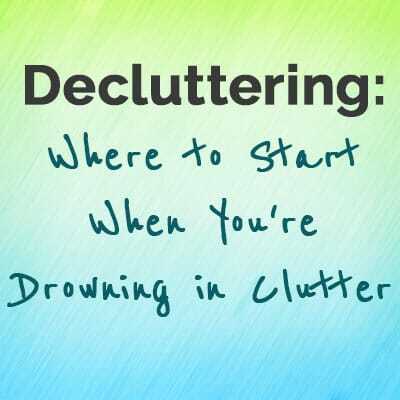 Mountains of clothes do nothing to help our bedrooms look neat and tidy, right? But the problem of in-between clothes is here to stay. By using a blanket rack and having regular clear-off times each week, we’ve been able to get in control of this problem area. Plus, our room looks fairly tidy with this solution. 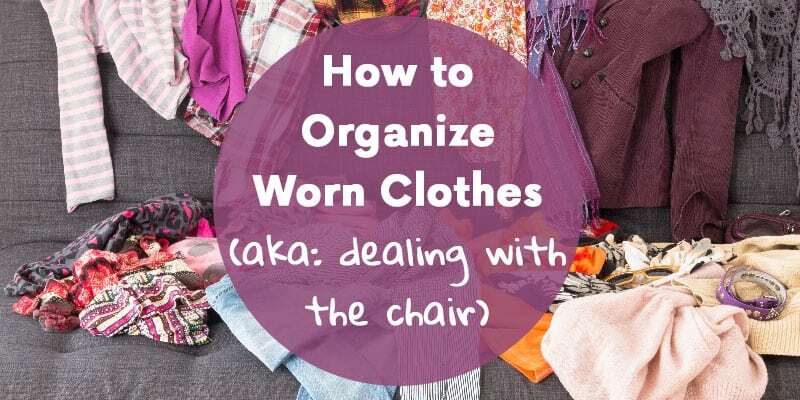 If you’re going to stick with your chair, I still think you’ll greatly benefit from having regular times each week when the chair must be emptied and the in-between clothes dealt with. I hope seeing how we handle this issue helps you out! ⇒ What do you do with worn, in-between clothing? Those blanket racks are super cute! This is one of my ongoing issues, the chair. I use a chair but I have been trying to clear it more often. I think you can audibly measure my sanity based on how empty the chair is lol. 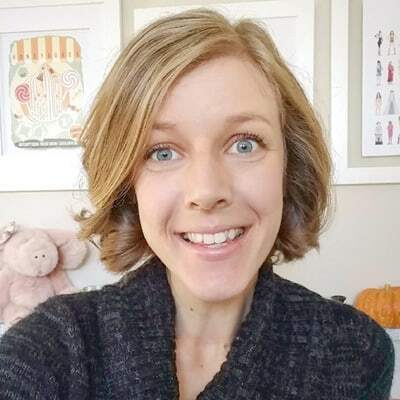 Great article, Christine!